This blog post is biased and misleading, and says nothing at all about what radiation does to DNA -- the main concern of all who read it. "Tritium, which is produced by cosmic radiation in the atmosphere and exists all around us, emits beta radiation." Tritium, which is produced by cosmic radiation in the atmosphere and exists all around us IN MINUTE QUANTITIES in surface water and in trace quantities elsewhere in the biosphere except around nuclear power plants (which are allowed to routinely emit hundreds of Curies of tritium every year), emits beta radiation." Instead you've misled people into thinking "tritium is all around us." Naturally-occurring tritium is NOT a substantial concern for anyone; but Canada's CANDU reactors are particularly bad, and NO tritium level is good for you: Tritium is extremely hazardous to humans because it can go anywhere in the body and is a DNA disrupter, as well as (usually) creating HO molecules inside the body, which are extremely hazardous as well (these oxidants are created because tritium is usually absorbed by the body as one atom of an "HTO" (instead of H2O) water molecule). The rest of that paragraph, about Carbon-14 dating, should also be amended to mention that C-14 dating will never be a reliable method of dating anything in the Nuclear Age (it will still work for dating artifacts from before 1945). This is because nuclear power plants and weapons produce vast quantities of the isotope and therefore, the levels of C-14 in the biosphere that exists now varies from place to place, and what percentage of C-14 a living object will be made of can no longer be relied on for dating purposes. Events such as Chernobyl, Fukushima, or any dry cask spent fuel fire release C-14 and many other radioactive nasty things, which then pollute the planet in uneven (and unfair) ways. The paragraph on neutrons may appear to the uninformed as being fairly neutral, but in reality, neutrons continue to be emitted by the spent fuel for tens of thousands of years and are a significant danger because they go through just about everything until they finally randomly smack hard into a nucleus, at which point, of course, they can do significant damage including causing other emissions. Neutron emissions are one of the reasons spent fuel is so dangerous and difficult to handle. Additionally, the neutron flux from spent fuel from reactors which are shut down permanently in mid-cycle is especially strong. And most reactors end up shutting down mid-cycle, because it's more profitable to keep them running until something too expensive to fix finally breaks than to retire them any other way. The last comparison, that x-rays and gamma rays "are like sunlight, except they have more energy" is absurd, unless a 1-mile-per-hour collision is like a 10,000-mile-per-hour collision. X-rays are about 10,000 times more powerful than visible light, and gamma rays are about a million times more powerful. You could have at least said "a lot more energy" instead of just "more energy". And describing dental x-rays as "very low" amounts of energy is likewise raising the bar. ALL types of ionizing radiation are very strong forms of energy emissions, whether they are "like" photons that the sun puts out (but with "a lot more energy") or high-speed helium atoms without their electrons (alpha particles), or high-speed electrons (beta particles), or penetrating but short-lived neutrons (about 15 minutes before they decay by beta emission into hydrogen, on average). Claiming that an alpha particle "doesn't go very far" because it is heavy is not only counter-intuitive, it's wrong (at least according to Newtonian physics, to the extent it applies at the sub-atomic level). I presume what the author intended to refer to is that the "large" alpha particle has a cross-section (as measured in barns, for example) which interacts with the nuclei of other atoms much more than, for example, a beta particle would. The "very large" charge is, of course, the main thing that interacts with other atoms and molecules: it ionizes them (for example by knocking off an electron). One alpha particle -- what you refer to as "low energy" -- can ionize thousands of molecules in the human body. A DNA molecule consists of a specific unique chain of approximately 13 billion atoms. Nearly every cell in the human body has a DNA chain (red blood cells being one exception). 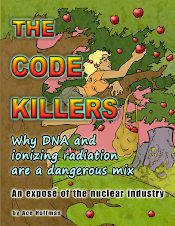 DNA damage from a single ionizing radioactive emission can cause THOUSANDS of separate cancers to develop! When discussing beta particles, you state they "can go a little further than alpha particles." This again is rather imprecise and in many ways dreadfully inaccurate. High energy beta particles can go nearly a centimeter through tissue (for example, all the way through a fetus's heart or a baby's pinkie). Lower energy beta particles don't penetrate so much, but oddly enough, most of the damage from beta emissions is done as it runs out of energy because at higher energy levels, it whizzes by things and is slightly slowed by them, but does not damage them because it goes by too fast to have much effect. So both "low-" and "high-" energy beta emissions do roughly the same level of damage, and in approximately the same volume of space -- though that pocket of damage is generally further away from the source for a high-energy beta emission. Your discussion of the effects of radiation on the human body didn't mention DNA damage at all, it sticks almost entirely to discussing the benefits of medical radiation, and then assures us that "radiation is all around us." Well, yes, it is, but there's no reason to increase the level of radiation that is already there. You seem to forget that your whole job is to make sure that level doesn't go up "significantly" but clearly, you've lost sight of what level of radiation is significant, and of DNA damage is significant. Even very low levels of radiation can be harmful to DNA and if a clean alternative exists, it should be taken, and if not, perhaps the whole process should be reevaluated. For energy needs, there are clean alternatives such as solar, wind, wave, geothermal, biomass, and so on. For medical diagnostics and treatments, there are also alternatives to many of the radioactive procedures, but cost of the installed radiation equipment (such as CT-SCAN machines) must be amortized over thousands of patients, and the cost of buying an entire different diagnostic device in addition to the CT machine is prohibitive, especially because some things will still probably need to be diagnosed with a CT-SCAN for many decades to come. But in general, medical doses have been significantly reduced over the past few decades because radiation is so incredibly dangerous, and because better and better radiation detectors are now available. >In earlier Science 101 posts, we talked about what makes up atoms, chemicals, matter and ionizing radiation. In this post, we will look at the different kinds of radiation. >There are four major types of radiation: alpha, beta, neutrons, and electromagnetic waves such as gamma rays. They differ in mass, energy and how deeply they penetrate people and objects. >The first is an alpha particle. These particles consist of two protons and two neutrons and are the heaviest type of radiation particle. Many of the naturally occurring radioactive materials in the earth, like uranium and thorium, emit alpha particles. An example most people are familiar with is the radon in our homes. >The second kind of radiation is a beta particle. It's an electron that is not attached to an atom (see previous blog post). It has a small mass and a negative charge. Tritium, which is produced by cosmic radiation in the atmosphere and exists all around us, emits beta radiation. Carbon-14, used in carbon-dating of fossils and other artifacts, also emits beta particles. Carbon-dating simply makes use of the fact that carbon-14 is radioactive. If you measure the beta particles, it tells you how much carbon-14 is left in the fossil, which allows you to calculate how long ago the organism was alive. >The third is a neutron. This is a particle that doesn't have any charge and is present in the nucleus of an atom. Neutrons are commonly seen when uranium atoms split, or fission, in a nuclear reactor. If it wasn't for the neutrons, you wouldn't be able to sustain the nuclear reaction used to generate power. >The last kind of radiation is electromagnetic radiation, like X-rays and gamma rays. They are probably the most familiar type of radiation because they are used widely in medical treatments. These rays are like sunlight, except they have more energy. Unlike the other kinds of radiation, there is no mass or charge. The amount of energy can range from very low, like in dental x-rays, to the very high levels seen in irradiators used to sterilize medical equipment. >As mentioned, these different kinds of radiation travel different distances and have different abilities to penetrate, depending on their mass and their energy. The figure (right) shows the differences. >Neutrons, because they don't have any charge, don't interact with materials very well and will go a very long way. The only way to stop them is with large quantities of water or other materials made of very light atoms. >On the other hand, an alpha particle, because it's very heavy and has a very large charge, doesn't go very far at all. This means an alpha particle can't even get through a sheet of paper. An alpha particle outside your body won't even penetrate the surface of your skin. But, if you inhale or ingest material that emits alpha particles, sensitive tissue like the lungs can be exposed. This is why high levels of radon are considered a problem in your home. The ability to stop alpha particles so easily is useful in smoke detectors, because a little smoke in the chamber is enough to stop the alpha particle and trigger the alarm. >Beta particles go a little farther than alpha particles. You could use a relatively small amount of shielding to stop them. They can get into your body but can't go all the way through. To be useful in medical imaging, beta particles must be released by a material that is injected into the body. They can also be very useful in cancer therapy if you can put the radioactive material in a tumor. >Gamma rays and x-rays can penetrate through the body. This is why they are useful in medicine—to show whether bones are broken or where there is toooth decay, or to locate a tumor. Shielding with dense materials like concrete and lead is used to avoid exposing sensitive internal organs or the people who may be working with this type of radiation. For example, the technician who does my dental x-rays puts a lead apron over me before taking the picture. That apron stops the x-rays from getting to the rest of my body. The technician stands behind the wall, which usually has some lead in it, to protect him or herself. >Radiation is all around us, but that is not a reason to be afraid. Different types of radiation behave differently, and some forms can be very useful. For more information on radiation, please see our website. >Don Cool, who holds a Ph.D. in radiation biology, advises the NRC on radiation safety and for 30 years has been active on international radiation safety committees.